The main aim of the archaeological diggings is to provide source material for historical reconstructions. But, the archaeology has failed so far to fulfil this objective in India, or to put it in other words, the historians of this sub-continent in general, with the exception of only a few, have been rather sceptical to use excavated material in their historical writings. Thus, the history of Kosala, Vatsa, Panchala, Kasi, etc., has been reconstructed almost entirely on the basis of the literary evidence, and without incorporating the excavated remains of Ayodhya, Sravasti, Kausambi, Ahichchhatra, Kampilya, Rajghat, etc. It is probably because of the fact that the history of ancient India has been treated generally as almost synonymous with the political history, dealing with events, concerning kings and royal dynasties. The archaeological source material for this type of historical writing has been more or less limited to the coins and the epigraphs. Realising this serious lacuna of the history of ancient India, several scholars have repeatedly pleaded during the last few years that the Indian history should be rewritten, and the new attempt should be the history of the masses, and, not of the achievements of various political powers. However, a serious attempt in this direction is yet to be made. Our own observation in this regard is that the best evidence for writing the history of the people of ancient India are formed by the archaeological remains acquired by scientific excavations from various historical sites. The present dissertation is an humble attempt in this direction, and aims at discussing various patterns of life of the people of Varanasi from earliest times upto about 7th century A. D. The study is fundamentally based upon the archaeological remains, unearthed from Rajghat, from time to time. The importance of Varanasi as a capital of the Kasi Mahajanupada and a cultural center of the Indian sub-continent is not unknown to the historians of ancient India. Several works on Varanasi and Kasi have been published in the past. Of these, the works of M. A. Sherring, E. B. Havell, E. Greaves, and Motichandra deserve special mention. Reference may also be made to an exhaustive article by A. S. Altekar and a note by B. C. Law in his book "Tribes in Ancient India," However, except Motichandra, none has attempted to present a detailed cultural study of ancient Varanasi. But, all these learned studies, including the one by Motichandra, are almost entirely based upon literary sources. As against these, the primary source of our cultural study remains to be the excavated material from Rajghat, the site of ancient Varanasi However, it must be frankly admitted that the numerous references in ancient Indian Literature to the manifold cultural attainments of Varanasi in the past had been one of the important factors for our selection of the topic for the dissertation. As far as we know, a cultural study, based on the excavated finds of any particular ancient city-site, which also figures prominently in the literature, has never been attempted earlier. During the study, it was realized that it was rather difficult to derive relevant information for the cultural reconstructions solely from the archaeological material. In the absence of the well, planned horizontal excavations, and the precise lateral context of various archaeological antiquities, the problem of interpreting the evidence became all the more difficult. Under these circumstances, we thought it desirable to seek help from the ancient Indian literature in understanding the archaeological evidence. An attempt was made to find corroboration from the contemporary literature, as far as possible. However, at times we failed to seek relevant information from the contemporary works. In such cases, necessary support was sought from the texts, composed prior to or later than the period of the antiquities under discussion. For example, the explanation of the underground structures. Belonging roughly to the Gupta Period, was found in Kautilya's Arthasastra only. The early Buddhist literature, including the Jatakas, has been frequently referred to for corroboration and explanation of the archaeological evidence for Period II, ranging from C. 600 B. C. to 200 B. C. since most authorities on the Buddhist studies agree that a large bulk of this literature must have been composed within the above mentioned time bracket. It needs to be mentioned here that we have unquestioningly relied on the generally accepted opinions regarding the chronology of the ancient Indian literature. As we did not dispute the accepted dates of the different literary works, we also unhesitatingly accepted the word of the excavators of Rajghat, in respect of the chronology of the various phases and the remains found in them. However, an attempt has been made to reorganize the different archaeological phases of the excavators, and to present a modified set of periodisation. For example, both the pre-NBP and the NBP phases formed parts of the Period I in the excavation report of Rajghat, but the separation of the two into different periods appeared more logical to us. We desired to finish our study around 600 A. D., but it had to be continued upto 700 A. D., since the Period IV of the excavators continued upto this date and there was no way to further demarcate the period upto 5th or 6th Cent. A. D.
As various strata of the subsequent periods were found badly disturbed in most of the trenches at Rajghat, it was not considered desirable to incorporate them in the present dissertation. Moreover, the available evidence clearly suggests that ancient Varanasi had already reached the zenith of its growth by the Gupta Period, and thus, the main objective of the present study-to trace the gradual development of this township was more or less fulfilled by concluding it at this stage. Although we accepted the view of excavators in the matters of chronology of the site, we did not hesitate to differ from their interpretations on several occasions. We would like to put on record that we were greatly emboldened to do so, after our meeting with our esteemed teacher Prof. A. K. Narain, Director of the Rajghat excavations, who very kindly and also sportingly permitted us to express our views boldly, even if they differed widely from the published report. The entire thesis has been divided into ten Chapters. The Chapter I is an exhaustive introduction to the subsequent study, and deals with the physical features of Varanasi and its surroundings, its brief political and cultural history, history of the archaeological work at Rajghat, and the methodology adopted in the dissertation. From the Chapter II onwards begins the study of various aspects of life of the people of ancient Varanasi. Thus, Chapter II is devoted to the study of town planning and the building activities. It is worthwhile to note here that a very limited number of structures belonging to the Periods III and IV were exposed during the excavations carried out by our department upto the year 1969. The evidence for the building activities was so meager that we found it very difficult to discuss in detail the structural features of various periods. Under the circumstances. We decided to concentrate on one particular area close to the river Ganga for further digging. The entire area selected by us for the operations was already robbed of its upper layers, during the railway diggings of 1940. The small scale excavation conducted by us during the session 1977-78, under the general supervision of Prof. K. K. Sinha proved more than a success and brought to notice the existence of several house complexes, roads, lanes, private and public drains, and several underground structures of varying dimensions and depth, the entire evidence have been incorporated in the Chapter II, and these new structures have naturally received a comparatively detailed treatment, since they obviously did not find place in the published report of Rajghat. However, our discussion of this new evidence falls short of a regular report, which we propose to publish very shortly. Chapter III deals with the discussion of various utensils, and an attempt has been made in it to determine their probable use. The Chapters IV, V and VI are devoted to the study of dress, ornaments and coiffure respectively. Most of the information for these Chapters has been gathered from the terracotta figurines of the different periods. The succeeding chapter VII has been devoted to the study of toilet accessories, mostly based on the actual specimens obtained from the site. The food habits and the kitchen equipments form the subject matter of Chapter VIII. The study is primarily based upon the interpretation of the different archaeological antiquities. An attempt has been made in the Chapter IX to discuss in detail the economic life of the people of Varanasi during different periods, as reflected by the archaeological remains unearthed from Rajghat. With a view to giving a comprehensive picture, help has also been sought from the various literary references, as corroborating and supplementing evidence to the information, gathered from the archaeological sources. The last Chapter is that of conclusion, in which we have tried to give an integrated account of the cultural attainments of Varanasi through the ages. 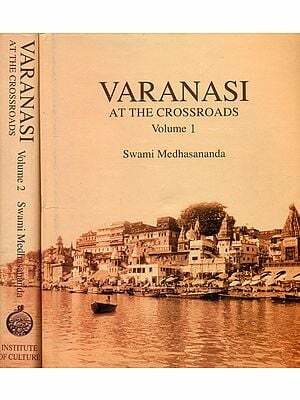 It is in this Chapter that an attempt has been made to trace the gradual development of Varanasi into an urban center, and to discuss the factors, which were presumably responsible for the growth of the township from time to time. It was realized at this stage that no account of the history of Varanasi would be complete without referring to its achievements in the religious spheres. Since the archaeological evidence for the religious life of the people of Varanasi was not found sufficient for a full Chapter, the same has been briefly in corporated in the last chapter of conclusion. It is privilege to put on record our sincere gratitude to all those persons who have variously contributed to the complete of the work. First of all, we wish to express our gratitude to our esteemed teacher, Prof. K. K. Sinha, who not only supervised the dissertation, but also extended several facilities like providing necessary funds for our excavation at Rajghat in the year 1977-78. Prof. J. N. Tiwari and Dr. P. C. Pant, Reader in the Department, have taken keen interest in the progress of our work. They unhesitatingly offered all the possible help, encouragement and suggestions, whenever approached. The latter not only suggested the topic of this dissertation tome, but also undertook the arduous work of going through almost the entire work. My sense of gratitude to them can hardly be expressed in words. Thanks are also owed to Dr. (Miss) Vidula Jayaswal, Lecturer in our department, for her help and suggestions in the preparation of this work. Thanks are also extended to Dr. Kalyan Krishna. Lecturer in the department of History of Arts, for his help in the preparation of the bibliography. Prof. Lallanji Gopal, Head of the department, and Prof. A. K. Narain have been a constant source of encouragement during the work. I express my sincere thanks to both of them. No words can express my feeling of indebtness to Shri Jai Ram Singh, S. T. A. Department of A. I. H. C. and Archaeology, Shri Jaya Shankar Mistra, Lecturer, Faculty of Fine Arts and Shri Kamakhya Prasad Singh, who is now in the U. P. Degree College, Varanasi, for the preparation of all the line illustration presented in the work. My fiend Shri Jaya Shankar Misra prepared almost al the line illustration for the Chapters IV, V and VI, and the remaining were prepared by my friend Shri Jai Ram Singh. Besides, the latter also did the painstaking job in arranging the plates, stenciling them and other multifarious work connected with the illustration. I also place on record my thanks to Shri B.D. Madhur S. T. A. of our department, for preparing some of the line illustrations of Chapter IV and for inking most of the pencil line drawings prepared by Shri Jaya Shankar Misra. Thanks are also due to Shri O.P. Khaneja, S. T. A., Department of A.I.H.C. and Archaeology for providing some of the photographs of the structural remains of the work done during the year 1977-78, and to Shri Ram Chandra Singh of the Bharat Kala Bhavan who photographed the small antiquities. I am also greatly indebted to Shri S. C. Ghildiyal, Librarian of the Indology Library, for promptly arranging the necessary books required for the work. Thanks are also due to Shri O.P. Tandon, Officer on Special duty in the Banaras Hindu University and Dy. Director, Bharat Kala Bhavan, and to Shri S. K. Srivastava, Lecturer, Department of Museology, for an easy access to the reserve collection of Rajghat material housed in the Kala Bhavan. We also wish to extend our thanks to Shri Lalta Misra. S. T. A. of our Department, for various help and to Shri Bhupendra Pal Singh for making us available the chart of animal remains. Our thanks are also due to Shri Subas Rai, a research scholar in the department, for correcting type mistakes in the final draft. We also extend our thanks to Shri D. N. Sarkar and Shri Shyamji for neatly typing the hand-written manuscript within very limited time. We would rather refrain from observing the formality of thanking my wife, Manju, for all sorts of help and bearing the entire burden of the family for almost a year.